This is the scent and essential oils of the season ! The legend of four thieves is well known ! During the bubonic plague outbreak legend has it that 4 thieves would rob the dead and they would use this combination of these essential oils and other botanicals to protect themselves from getting ill. This Immune Supporting Essential Oil Blend has a wonderful spicy scent with a hint of citrus..Such a great scent for the holidays !.I use our E.O.Blend every day in my diffuser ! ...This is one of nature’s most powerful & natural home remedies ! And it is a fantastic spicy rich/ holiday scent to use in your diffuser to scent your home and office...This is a great E.O. blend to use during the cold and flu season to chase off those viruses,germs and bacteria..
We want our customers to experience the excellent quality of our products that have been touched by mother nature! This is one of my favorite E.O. Blends to disinfect around the house and to also help eliminate odors. Before your holiday party or special company comes over use a mixture of 5 to 6 drops of our "Botanical 5 Immune Blend to 1 cup of baking soda,make sure you mix it well and let sit at least 5 hours or overnight in an airtight jar to make sure the oil is absorbed by the baking soda. The day you want to make your room/home smell amazing just sprinkle this great mixture over carpets let sit for a little while and vacuum thoroughly. (Your vacuum will also smell great ! Diffuse 5-7 drops..you can also add a drop or 2 of other E.O. 's to change the scent experience some ! Many diffusers will turn off by themselves but the normal time to diffuse the essential oil blend for 15–30 minutes in your home. I like to add a few drops to my dishwasher and dishpan to keep it fresh and help kill germs...I also like putting a few drops on a cotton pad and place in an open space in closets and cupboards so they smell great ! 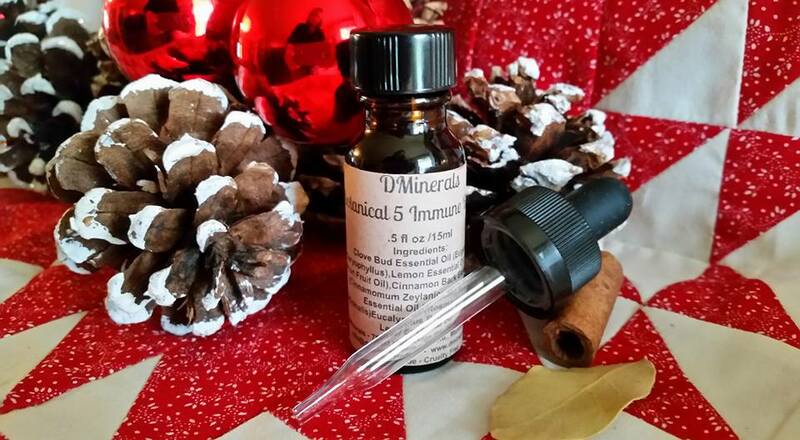 Make your own "DMinerals Botanical 5 Immune Blend Spray" ! If you have purchased our DMinerals Botanical 5 Immune Blend Oil then you can mix up your own spray ! Many use DMinerals Botanical 5 Immune Blend Oil and spray to replace some household cleaning products. It has a beautiful rich spicy aroma when sprayed or diffused ! Put a few drops in the dishwasher. Mist on the bottoms of feet when cold & flu season arrive or you start to feel sick. Spray in those stinky hotel rooms and spray on the hotel rooms heat vents and the beds ! Spray on a tissue and inhale and rub on end of nose. Add to your laundry cycle and washer load. ~ 40 to 60 drops of "DMinerals Botanical 5 Immune Blend Oil"
***Put all ingredients in your glass spray bottle adding the water last and shake well before each use ! ***You can make different size bottles ! Make some to carry in your purse and car (2oz works great in your purse). We ALWAYS Keep/store our essential oils in a cool, dark place. We suggest ALWAYS diluting essential oils with a good carrier oil before applying to the skin because essential oils are super concentrated.